Chalk Farm School of Dance is a friendly, local dancing school situated in the heart of Primrose Hill in North West London. It is within easy access of the surrounding areas of Camden Town, Kentish Town, Regents Park, Swiss Cottage, Hampstead and Belsize Park. The school started in 1991 with a few pupils who expressed an interest in attending ballet lessons at Nursery and Primary level and has now expanded in accordance with local needs. Ballet classes now extend to Grade 6 and beyond as well as classes for Under 5�s at Primrose Hill Community Centre. 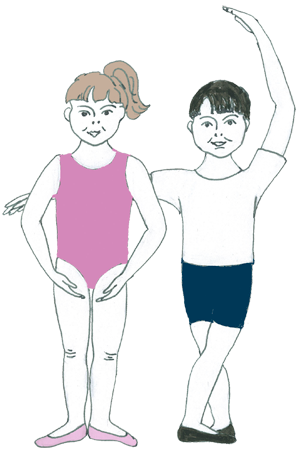 Pupils are trained in the Royal Academy of Dance syllabus and although most pupils are entered for exams it is not compulsory. Chalk Farm School of Dance also provides an annual performance in the local Primrose Hill Festival during the Summer term. Chalk Farm School of Dance has links with Chrystel Arts Agency and some of the children have been successful in gaining work in Television and Film. Catherine trained at the Hammond School, Chester as a dancer and dance teacher and gained her RAD Teaching Certificate. After working as a professional dancer she expanded her training by attending the Drama Course at the City Lit, Holborn. She has worked in theatre and tv both as a dancer and actress and has been teaching for over 30yrs. Catherine is a fully registered member of The Royal Academy of Dance and regularly enters pupils successfully for the RAD examinations. As well as teaching at Chalk Farm School of Dance, Catherine also teaches on a freelance basis at other dance schools in London. These include Chrystel Arts Theatre School, Edgware and various local Nursery schools. She also teaches Adult Ballet classes for beginners and more advanced students at Islington Arts Factory. She has choreographed ballets using children from the various schools for their respective school shows, as well as choreographing two children�s ballets which were performed at the Commonwealth Institute, Kensington and at The Secombe Centre, Sutton. Catherine teaches all of the classes at Chalk Farm School of Dance. Occasionally, however, it may be necessary to substitute with another suitably qualified teacher. She is also a registered licensed Chaperone.